Happy National Ice Cream Day, and Day #10 of Chocolate and Fruit Theme Week here on Chocolate Banquet. To celebrate, I enjoyed a small bowl of Chocolate Covered Strawberry Ice Cream from Safeway (Pleasanton, CA). 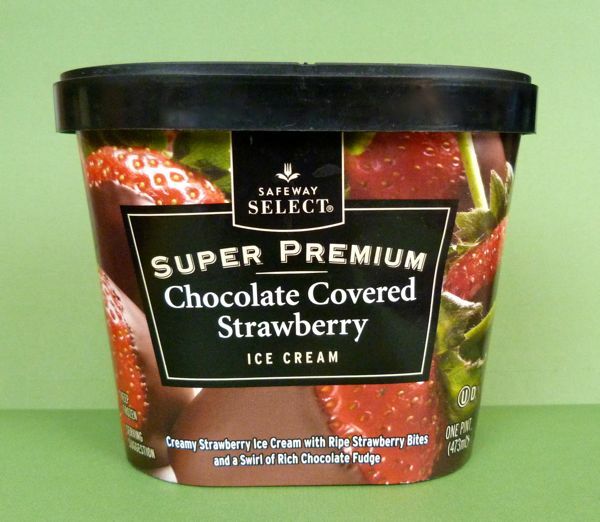 A ribbon of chocolate flowed through a base of strawberry ice cream studded with ripe strawberry fruit bits. Garnished with a few fresh strawberries, this ice cream became a great warm summer evening dessert -- eaten slowly while listening to crickets chirping outside in the backyard garden.